Oh, dolphins! Most people I know have a real fondness for these gentle, highly intelligent sea creatures. With some, that affection is so great that it almost borders on reverence. 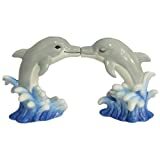 They love to watch them, dream of interacting with them, and even incorporate dolphin themes into their home decor. When they use the phrase, "I ♥ dolphins" they certainly do NOT mean "for dinner." We'll eat mahi-mahi, but not a Bottlenose or a Bolo. Not everyone, everywhere, feels that way, though. For those of us who see these congenial, seemingly compassionate, marine mammals as something a lot more special than plate filler, there are plenty of ways to express our fondness for them - even when we're in the kitchen. From kitchen clocks and cutting boards to coasters and cooking accessories, there are plenty of choices to bring a little Flipper flair into the kitchen of a dolphin loving cook. A Bottlenose Dolphin, off the coast of Alabama in 2006. Would you like some dolphins in your kitchen? No, not to cook, but to watch over your culinary activities! Time was, just a decade or two ago, you could walk into an American restaurant, and, chances were, you might see dishes like Grilled Dolphin listed on the menu. Some people wouldn't order these dishes. Others even got agitated, and launched an effort to save Flipper's friends from being made into fish sandwiches. You hardly ever see this any more. What changed? Did the pressure brought on restaurateurs by activists make them discontinue their recipes? No. Nothing changed, really. Except some words. Just words. Mahi-Mahi, or the common dolphinfish, is often served grilled, broiled, baked, and sometimes fried. However, the name common dolphinfish, is a bit of a misnomer. No one I know wants to eat a dolphin. They just don't. In the United States, there is a great affection for and sensitivity to, the dolphin that does NOT exist in some other parts of the world. A few years back, some people assumed that our favorite marine mammal was being slaughtered and served up for lunch in eateries across America. They became very agitated at seeing the word "dolphin" on menus, and began a campaign to save the dolphin from being eaten. They never saved a single marine mammal with their actions. They did, however, demonstrate how confused and uneducated they were. So, let's clear up the confusion right now. Male mahi mahi, caught off the coast of Hatteras, NC. Dolphins are NOT fish. They are marine mammals. Mahi-Mahi ARE fish. They are NOT dolphins, in spite of the term dolphin-fish. As mammals, dolphins breathe air, not water, and give birth to live young, just as we do. Fish have gills, cannot survive by breathing air, and generally reproduce by spawning. The common dolphinfish is not related to Flipper and friends - not even distantly. These days, the term mahi-mahi is now what you'll see most often on menus. If you see the word "dolphin" on a restaurant menu in the U.S., it's probably a hold over from the days when the term dolphinfish was more widely used. They were originally called that, because of their habit of swimming around near dolphins. That didn't make them dolphins anymore that hanging out with geese will make you a goose. If you should see the word dolphin on a menu, and are uneasy about it, just confirm with your server that what's actually being served is, indeed, mahimahi. Whether your home has just a touch of coastal flavor, a thoroughly nautical decor, or something in between, dolphin themed items fit right in, adding a delightful little touch to any room. So, don't forget the kitchen, when it comes to special little touches. 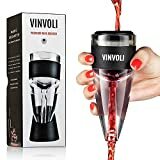 Here are some ideas from Amazon, to add a little dolphin flair to your kitchen, or that of your favorite dolphin lover. Dolphin on an American Restaurant Menu? A few years back, we were at a seaside eatery that specialized in seafood. I noticed that one of their sandwich selections was grilled or blackened dolphin. Since that didn't look right to me, I asked the server, who explained that it was actually mahi-mahi, not real dolphin. Being the info-holic that I am, I did look up information on the two later, to verifiy what he had told me. Sure enough, he was right. Of course, it's always wise to do your own research, and come to your own conclusions, rather than just pouncing on a single word (or the word of someone else) and running with it. Have you seen the word "dolphin" on a menu in the United States? 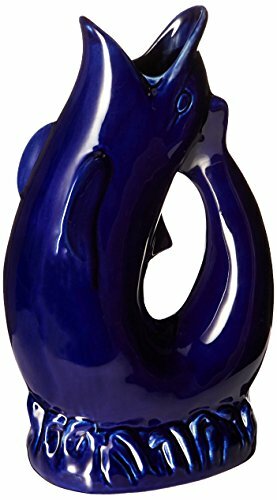 Dolphin kitchen accessories are a nice way to have dolphins in your kitchen! Whether you need a special little thank you gift, or just want to brighten your own kitchen, don't forget to check Zazzle for ideas. Here are several of the hundreds and hundreds of things you'll find there. While looking for something else, I came across the recipe for a delicious sounding dish: Macadamia Mahi Mahi. In addition to the fact that just about anything with macadamia nuts sounds good to me, this chef gives a couple of nice little general cooking tips in this video. I like that! Note for fans of out-takes: Be sure to watch all the way to the end to see how he fumbled his words on a couple of false starts. The cook here says this is also a good recipe for salmon or tuna. Bring a taste of the islands to your table. If you just can't swing a trip to Greece this year, try this instead. A number of nations have marine mammal protection acts. Marine mammals are protected in U.S. waters, under the Marine Mammal Protection Act of 1972. Sadly, in some countries, dolphins are still slaughtered and eaten. Discover some cool dolphin bath accessories! Here are my personal picks, along with some dolphin fast facts, and two fascinating dolphin videos. Would you want (or do you have ) a dolphin in your kitchen? CruiseReady, The gluggle jug, the kitchen mitts, the potholder and the wine holder are my favorites. Do you not have any tiles? The other day I was looking at pictures of Italian and Portuguese restaurants in Massachusetts and love the mix of tiles on the walls. Bathrooms and kitchens always look better with dolphin-related decor. Yes, Mahi Mani is quite tasty indeed. A seaside restaurant here does a blackened Mahi Mahi sandwich that is really good - and I'm not usually a big sandwich fan. I've eaten fresh Mahi Mahi my neighbors caught. They called it "dolphin" and I was disgusted until I knew the difference. It's delicious. I agree that killing them is wrong. Still, there are those that do. Shame! 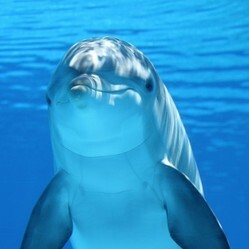 As to the cognitive issue - did you know that dolphins even recognize themselves in a mirror? Thankfully, you rarely, if ever, see the word 'dophin' on a menu in the US anymore. You do see MahiMahi, and it's good that the moniker 'dolphinfish' has fallen out of favor. It tended to lead to confusion.for the uninformed. A very worthwhile article. This reminds me of a lecture that I had when doing my masters in Philosophy. The lecturer, Professor John Harris, said that determining whether a creature is a person matters because it decide the manner in which you have it for lunch! Killing persons without cause is murder, and I think that there is a case for saying that, as dolphins display high level cognitive behaviour and have been known to save human lives, therefore showing evidence of conscience and empathy, they have the moral characteristics of persons. To kill and eat them is absolutely wrong. Thanks for informing those of us on this side of the Atlantic of the mahimahi. We don't have it in our waters, so we might be confused if we were in US restaurants. Dolphin switch plates and whale light switch covers for any room of the home, to bring a little magic of the sea inside. Find out about Wholpins, too!